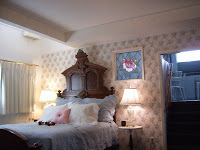 Just this past week we changed the furnishings of the Rose Suite to a beautiful walnut antique headboard and dresser. We also changed the art on the wall. These furnishings came to me via my grandmother. 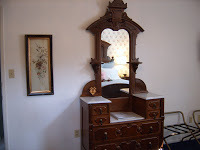 She used the furniture in the late 1890’s in her home. I have her photos of some of the pieces she used. After my grandmother’s (Meta Pillsbury Dunbar) death, I inherited several pieces of her furniture. Some of it had been stored in her Illinois attic for such a long time that it was damaged. In Anchorage we are extremely fortunate to have a man who does repair and restoration beyond outstanding! He worked on this “new” furniture and has brought it back to its glory. I hope you enjoy the pictures. More than that I want our guests to enjoy the quiet relaxed space.